The Conference of Peripheral Maritime Regions (CPMR) and the Atlantic Arc Commission (AAC) have presented positive proposals to Michel Barnier, the European Commission’s Chief Negotiator for the Preparation and Conduct of the Negotiations with the UK, to reduce Brexit’s disproportionate impact on Europe’s regions. 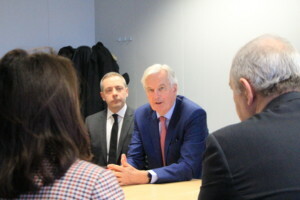 At the initiative of the Atlantic Arc Commission, chaired by the Pays de la Loire region, a CPMR delegation met with Mr Barnier on 29 January 2018 to stress regions’ fears that Brexit, and particularly a hard Brexit, will have harmful consequences for their territories as well as the importance of continued cooperation between European and UK regions post-Brexit. The delegation consisted of Vasco Cordeiro, CPMR President and President of the Government of the Azores , Christelle Morançais, President of the AAC and the Pays de la Loire Region, Bruno Retailleau, former President of the AAC and the Pays de la Loire region, and Vanessa Charbonneau, Vice-President of the Pays de la Loire region, in charge of European Affairs. Highlighted the importance of an agreement in the final Brexit bill between the UK and the EU on the shared management of the fisheries sector, especially in the Atlantic, Channel and North Sea areas. This sector is at risk of social, economic and ecological damage if it is not managed effectively. Stressed that decisions taken during the Brexit negotiations will have a direct impact on the ports and shipping lines of the Atlantic Arc, which could have consequences for the tourism and trade sectors in all European regions. The CPMR delegation proposed the implementation of a budgetary mechanism for the EU27 to mitigate the territorial impacts of Brexit in the regions. Underlined the importance of territorial cooperation programmes and macro-regional strategies, to date absent from the negotiations, as a means for the UK and Europe to continue to work together. “The UK has outlined the importance of continued cooperation through research, innovation, and training. They must now show that territorial cooperation is high on their agenda in the Brexit negotiations. Concerning the fishing industry, particularly in the Atlantic Arc, Bruno Retailleau, Regional Councillor and former President of the Pays de la Loire Region and the Atlantic Arc Commission, said: “The renationalisation of the UK’s territorial waters following Brexit would have a major impact on the fishing activity of Atlantic vessels. It could also mean UK fishermen are not subject to the requirements of the Common Fisheries Policy after Brexit, leading to unfair competition between UK and European fishermen. Read the CPMR’s Cardiff Declaration, signed in November 2017 by regions in Europe’s North Sea, Atlantic and Channel sea basins. Read the CPMR Atlantic Arc Commission’s Political Declaration on Brexit, agreed by its 17 member Regions from five Atlantic Member States (PT, ES, FR, IE and UK).